Residence for the owner of a small, innovative winery in the rolling hills above pastoral Anderson Valley of Mendocino County. The owner purposefully selected the site on his property, which was a natural clearing along the side of a prominent hill. Directly west from that spot, one can clearly see his winery and vineyard. The Green Residence is essentially two long rectangular forms, directly side-by-side and oriented towards the vineyard. The forms seem to be sliding past each other, only to be restrained by the anchoring force of the massive cast-in-place concrete fireplace. This becomes the focus for an expansive interior space which is resultant from the intersection of the two linear wings. The roof hovers above, a simple folded plane held aloft by a rhythmic series of powerfully emphatic wood columns, salvaged from fallen redwood trees. The 16" square columns, carved with a carpenter's skill saw, form the important structural as well as aesthetic theme of the building. One enters the house from the more shaded east elevation, the entry recessed under the overhang of the gabled roof. Just within the door, the eye catches bright light beyond and is drawn entirely through the house to a view of the vineyards framed in the distance. The approximately 6,800 s.f. residence is integrated into its sloping site among groves of fir and redwood; the principal rooms share a sunny orientation to a magnificent ravine with spectacular views across to a tree-lined ridge beyond. The house is generous in open, cathedral ceilinged volumes of light-filled space; informal with a sense of repose. The main wing contains the Master Bedroom Suite with additional bedrooms on the level below. A landscaped indoor garden links the two floor levels with stair placed into the soil. The roof above is penetrated with a large triangular skylight which floods the garden with natural sun. The Main Floor contains the activity spaces of Living Room, Dining Room and Kitchen linked under the expansive cathedral ceiling. The spaces all open onto a southwest facing deck, looking over the tree-filled site and to the view beyond. 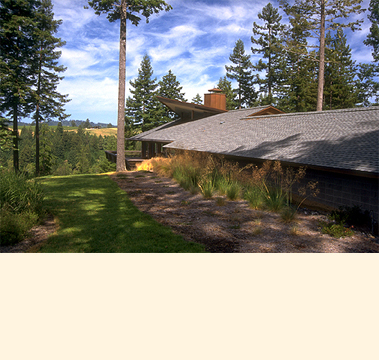 A triangular portion of the south-west roof plane projects beyond the ridge and forms a clerestory window dormer allowing natural daylighting to fill the Living Room directly below. All built-in cabinetry, furnishings and landscaping was designed by Aaron Green. Colored glass sconces and dining room chandelier shade were designed by his son, and owner, Allan Green.